Comfort meets style with the Benson reclining sectional. With two storage compartments, four cup holders, and two recliners, this couch is perfect for any living room, family area, or TV space. The Benson 41164 Two Chair Reclining Sectional by Palliser at AHFA in the area. Product availability may vary. Contact us for the most current availability on this product. 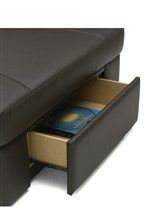 41164-A1 45 Degree Storage Wedge 2 36" 36" 36"
41164-04 Ottoman 1 44" 28" 19"
41164-10 Armless Chair 2 24" 39" 40"
41164-47 LAF Recliner 1 34" 39" 40"
41164-46 RAF Recliner 1 34" 39" 40"
Frame Construction The most noticeable difference is the all-wood frame on the Astor actually makes it a more attractive chair than the Scandinavian chairs like Ekornes, which use exposed metal tubing and hardware as part of the frame. 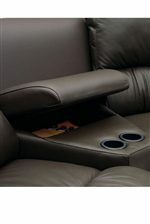 Padding & Ergonomics Luxurious, ergonomically designed seating surfaces, sculpted from High Resiliency Cold Molded Foam along with a unique lumbar support system and adjustable headrest make the Astor as comfortable as any recliner made. Seating luxury is combined with transitional styling suited to modern or traditional rooms. Palliser's Benson collection includes sectionals featuring ample, luxurious proportions, pocket coils seating and eight-way, hand-tied construction. Perfect for movie nights, family gatherings, or simply curling up with a book. All pieces can be ordered separately, allowing you to pick and choose which furnishings will work best for you. Additionally, the sectionals are available in countless fabrics and colors. The Benson 41164 collection is a great option if you are looking for Casual furniture in the area. Browse other items in the Benson 41164 collection from AHFA in the area.